Both concurrent and construct validity are important psychometric properties for perceived exertion scales applied in the clinical and performance settings. 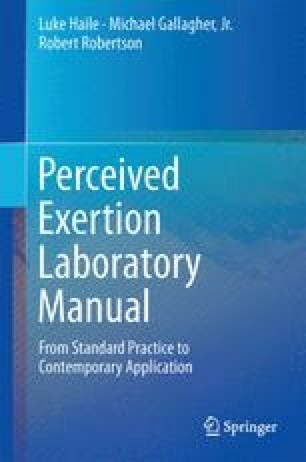 A graded exercise test that employs a perceptual estimation protocol is the standard for determination of perceived exertion scale validity for both aerobic and resistance exercise. Both undifferentiated and differentiated RPE can be measured using a scale validity experiment, but special attention should be paid to determination of the dominant RPE signal during exercise. Concurrent and construct validity evidence has been shown for both undifferentiated and differentiated RPE in various sample populations performing aerobic and resistance exercise. A perceived exertion scale that demonstrates concurrent and construct validity can be applied to both exercise testing and prescription in hospital and field settings. Such applications can include the prediction of impending exercise test termination and exercise intensity self-regulation. The primary purpose of this laboratory experiment is to establish concurrent and construct validity for an OMNI RPE Scale. Secondary purposes include the comparison of concurrent validity evidence between the OMNI RPE Scale and the Borg Scale and to determine differentiated RPE signal dominance. Merriam-Webster Online (2014) Dictionary and thesauraus. http://www.merriam-webster.com/netdict.html. Accessed 28 Mar 2014.